You will be able to see the start rank updating in about 6-8 days. I don’t Accept Alexa Rank certified Domains. Improve usa alexa rank in 27 days. Guaranteed result with 102% Guarantee...!!! 1. The Alexa certified web/blogs is not accepted. I am not able to improve rank which is certified. 2. If the rank already below 510k. for one gig, I only work 20 days, and just make sure maintain the rank under 510,000. 3. By default the main country is USA. If you need a main country, different then USA, just contact me via PM. When the site below the rank ,the service will stopped. 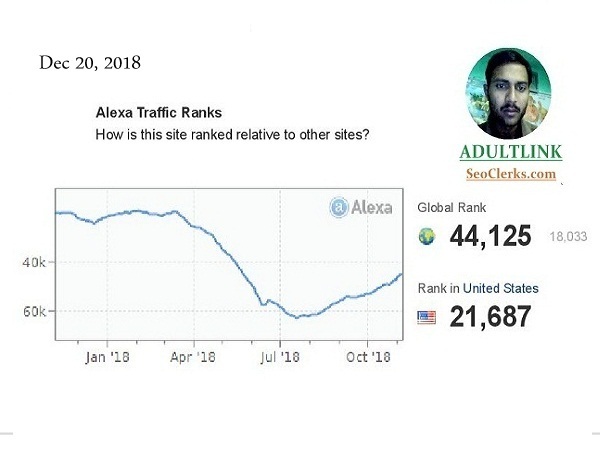 I will improve your Alexa Ranking below USA 51k and Global 510k is ranked 5 out of 5. Based on 46 user reviews.